Have you visited one of these? Kroger has them at Graceland and Great Southern Shopping Centers. If you're used to shopping at Kroger they are a real hoot. Recently Kroger announced it would build one of these Marketplaces on the east end of Middletown, next to the current Kroger location. Walk in and find the lobby carpeted and decorated with sofas and other furniture you can buy "a la cart" (ha-ha, their joke not mine). In addition to the usual Kroger there are linens and housewares and furniture aisles and more. For details visit this article. 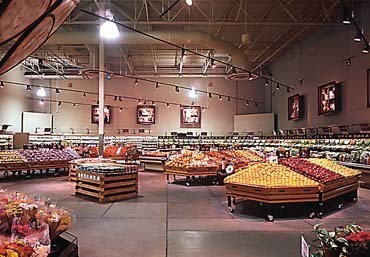 The article claims Kroger plans 4 more of these in Central Ohio. Yet another attempt to compete with Wal-Mart. Funny, if so many people claim to hate Wal-Mart why are so many other retailers trying to be more like them?